Highrise is a simple CRM Software tool that helps you stay organized. 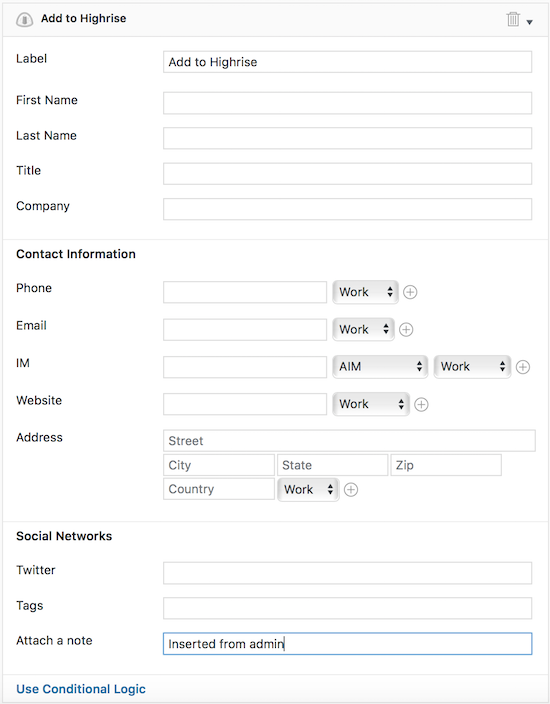 Create Highrise CRM forms to add users to your Highrise CRM account right from WordPress. Please note, you must have a Highrise account in order to use the Highrise add-on. If you haven't already done so, install and activate Formidable Forms Pro. In your WordPress admin, go to 'Formidable' → 'Add-Ons' and click the 'Install' button for the Highrise CRM WordPress plugin. Now that the plugin is activated, go to "Formidable" → "Global Settings" and click the "Highrise" tab. Insert your Highrise subdomain and API token. Go to the form you wish to work with. Click "Settings" → "Form Actions". Click the Highrise logo to add a Highrise action to your form. Select the fields from your form that should be linked to your Highrise fields and add any other settings you would like. If you would like to conditionally add submissions to your Highrise CRM, you will need to add Conditional Logic. Please note that Conditional Logic is only available in the Pro version of Formidable Forms. Don't forget to hit "Update" so these settings will be saved.